Today is the third anniversary of Kim Jong-il’s death, marking the completion of a traditional period of mourning for Korean leaders and the presumed consolidation of power under Kim Jong-il’s successor, Kim Jong-un. During the three-year mourning period following the death of North Korea’s founder Kim Il-sung in the mid-1990s, Kim Jong-il waged a struggle behind the scenes to overcome the Arduous March, a famine that decimated North Korea’s population. In 1997, Kim Jong-il emerged publicly as chairman of the National Defense Commission and as leader of a “military first [pdf]” policy. Kim Jong-un has made more visible moves than Kim Jong-il to consolidate power in the three years since his father’s death, but he has arguably faces a more serious challenge to North Korea’s honor and survival than his father did. Pyongyang perceives that challenge is being executed as part of a two-pronged pincer movement: on the one hand, North Korea attributes the UN Commission of Inquiry accusing North Korea of crimes against humanity to a U.S. strategy of naming and shaming Pyongyang; on the other hand, North Korea suspects that the U.S. government is orchestrating an even more insidious policy through Hollywood of pointing and laughing at the Kim regime, going even so far as to dramatize Kim’s assassination in a comedic plot that treats Kim Jong-un as a laughingstock. In fact, Kim Jong-il made North Korea’s comedic debut a decade ago as a crafty lonely warbler in Team America: World Police. While this characterization poked fun at Kim Jong-il, it also showed him outfoxing his nemesis Hans Blix, Goldfinger-style, by trapping Blix in an aquarium full of man-eating fish, and the final physical attack on Kim Jong-il was done after he’s revealed his inhuman form. Although Kim was the object of humor, dishonor was conveyed with subtlety. Nonetheless, the damage was done as the film so well publicized the accumulated excesses that are part of the cult of personality surrounding North Korea’s Kim family leadership. 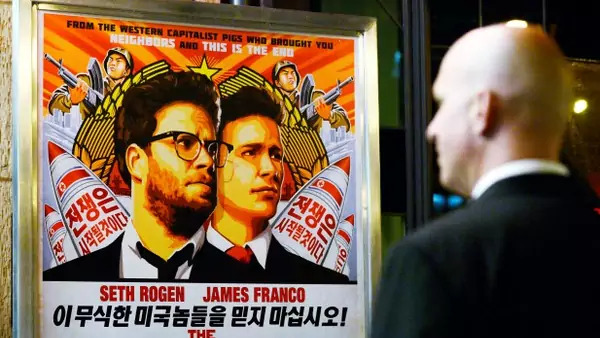 The path from Team America to the less subtle, edgier The Interview is obvious; the bizarre Kim regime seems to cry out for satire and mockery. Why not exploit North Korean propaganda as part of a Hollywood marketing strategy? North Korea’s offensive capabilities to carry out its over-the-top threats have grown unchecked. An inward-looking North Korea recovering from famine had no recourse by which to respond to the Team America, but a decade later, North Korea has steadily honed its nuclear, missile, and cyber capabilities as ways to defend its leadership. Along with its nuclear and missile tests in 2013, North Korean–attributed cyberattacks were honed on South Korean banks in 2011 and 2012 prior to the Sony hack on November 25 this year. North Korea and/or its friends known as the Guardians of Peace have responded directly to Hollywood’s attack on Kim Jong-un’s honor with a devastating hack that leaked embarrassing insider revelations and threatening to undertake even more apocalyptic action toward those who might screen The Interview nationwide. North Korea’s increasing economic and information interdependence works both ways. Many analysts have seen the penetration of information and the market economy into North Korea as sources of instability that would ultimately overturn the regime, but the Sony example shows how North Korea and/or its friends are turning the tables by releasing embarrassing hacked information to create losses rather than profits for Sony. The devastating revelations from Sony’s files have inflicted an in-kind cost to Sony for the reputational damage North Korea perceives itself as having suffered from The Interview, while economic costs of the attack to Sony at $100 million and counting drive up the break-even point for success of the project beyond the $44 million cost of making the movie. North Korea’s counterattack imposes devastating costs that may overwhelm the calculated economic returns that The Interview may gain by exploiting the North Korean regime for publicity. Exaggerated threats to cinemas that show the movie have already resulted in the cancellation of the movie’s New York premiere. Ambiguity of attribution and guerrilla-style tactical surprise are classic North Korea-style tactics that date back to the origins of the North Korean state. The North Korean state has retained the use of guerrilla tactics as an outlier in the international system by testing the boundaries of international tolerance for both its conventional attacks on South Korea in 2010, and for its ongoing nuclear, missile, and now cyber programs. Neighboring states continue to struggle with how to hold North Korea accountable for its actions. This challenge is even greater in a case involving ambiguity of attribution in an attack on a private actor. Even as the methods for recourse are unclear, the necessity of crafting mechanisms for holding North Korea account so as to deter future attacks of this sort is essential. The growing international challenge to the viability of Kim Jong-un’s leadership, both on human rights grounds and as a regime that simply doesn’t pass the laugh test in the twenty-first century, may indeed be much more serious than the challenge of the famine that his father faced in the 1990s. Kim Jong-un has announced his goal of simultaneous nuclear and economic development, but greater reliance on nuclear, missile, and cyber threats will come at a cost to international willingness to help him with economic development by engendering greater international hostility to his rule. In this respect, Kim Jong-un may find that he is even more lonely than his father was.